Begin with the easiest solution. With networking, this is checking to make sure the network cable is properly connected to both the computer and the network port on the wall. If you do not see a blinking light on your network card, chances are the physical connection to the network may be the problem. Double check those cables. If you are in a room that has more than one network port, try connecting using a different port. If that works, then the network port may be the problem. You should let your tech specialist or network administrator know that there is a bad port in your room. If you are on a wireless network, moving your computer may cause you to fall out of the range of the wireless access point. Try moving your computer to a different location to see if you regain connectivity. Sometimes your computer may need to have its IP address renewed. Each computer on the network needs to have a unique address, known as the IP address. To renew the IP address, select System Preferences, Network, then make sure you select the correct connection from the Show menu (either Built-in Ethernet for the wired connection or Airport for the wireless connection). Next, click on the TCP/IP tab, and make sure it’s set to Use DHCP under Configure IPv4. 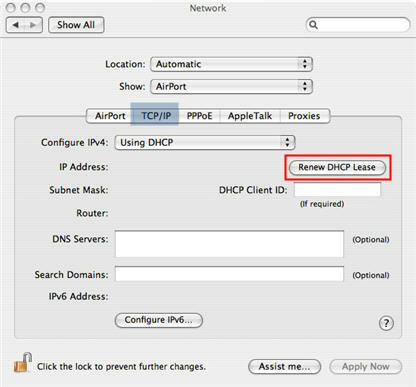 You can use the Renew DHCP Lease button to renew your IP address. If you still cannot connect after trying these troubleshooting steps, your network card may be improperly installed, or it may not be properly configured to work with your network. You will need to contact your tech specialist for assistance.